The International Atomic Energy Agency released its long-awaited report detailing the military dimensions of the Iranian regime’s nuclear program and unveiled disturbing new details that have left the Iran lobby, especially the National Iranian American Council, scrambling to cover up. In the report, Iran was actively designing a nuclear weapon until at least 2009, far later than virtually all intelligence agencies had believed and proving the regime’s ability to conceal its design activities while under intense scrutiny and even spying from various nations. The report, which according to the New York Times, was compiled largely based on partial answers provided by Iran after completing nuclear talks last July, concluded that the regime was “conducting computer modeling of a nuclear explosive device” before 2004 and continued those efforts right through President Obama’s first term in office. 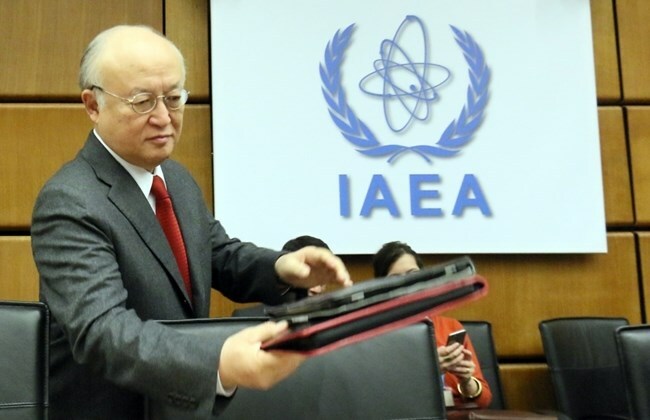 The IAEA detailed a long list of experiments conducted by the regime “relevant to a nuclear explosive device” directly contradicting claims made by the Iran lobby and the mullahs that Iranian regime’s nuclear program was only for civilian and peaceful purposes. We now know through Iranian regime’s own admission, it was trying to build nuclear weapons at a feverish pace. But the IAEA concluded that substantial gaps existed because the regime refused to provide answers to several key questions, restricted the ability to interview key scientific personnel and limited sampling of sites and facilities only after they had been scrubbed. The nuclear deal negotiated with the Iranian regime mandated limiting Iran’s ability to build a bomb for at least 15 years, but the inability to paint a complete picture and the revelation that Tehran had been conducting work unbeknownst to the rest of the world leaves significant doubt as even that goal is attainable. According to the Times, Tehran gave no substantive answers to one quarter of the dozen specific questions or documents it was asked about, leaving open the question of how much progress it had made. At Iran’s Parchin complex, where the agency thought there had been nuclear experimental work in 2000, “extensive activities undertaken by Iran” to alter the site “seriously undermined” the agency’s ability to come to conclusions about past activities, the report said. The response from Capitol Hill was swift and bipartisan. “I think we’re getting off to a very, very poor start,” Senate Foreign Relations Committee Chairman Bob Corker (R-Tenn.) told reporters after a roughly two-hour top-secret committee hearing. “These are exactly the things that we talked about during the hearing process that raised concerns and they’re being validated right now,” he added. “It just sets a very bad precedent that if Iran thinks it can violate the world’s will, as expressed by Security Council resolutions, and in essence face no consequence for it,” said Sen. Robert Menendez (N.J.), one of the four Democrats who voted against the deal in September. Parsi of course does not mention the fact the work conducted through 2009 was denied by Tehran and by Parsi himself and that the refusal by the mullahs to answer specific questions left the report, at best incomplete, and at worst a whitewash. The Iran lobby is now finding it harder and harder to cover for the regime because its own promises and arguments are now all coming to be uncovered as falsehoods and outright deceptions. The fortunate thing about the internet is you can always search and look back at the statements people like Parsi have made and in the context of what is happening now, realize just how really wrong they were. With the IAEA report, it’s just another blow to any shred of credibility the Iran lobby had.